My favorite part of this photo is how obviously thrilled Stine is. My second is the eerie specter looming over Stine’s shoulder. 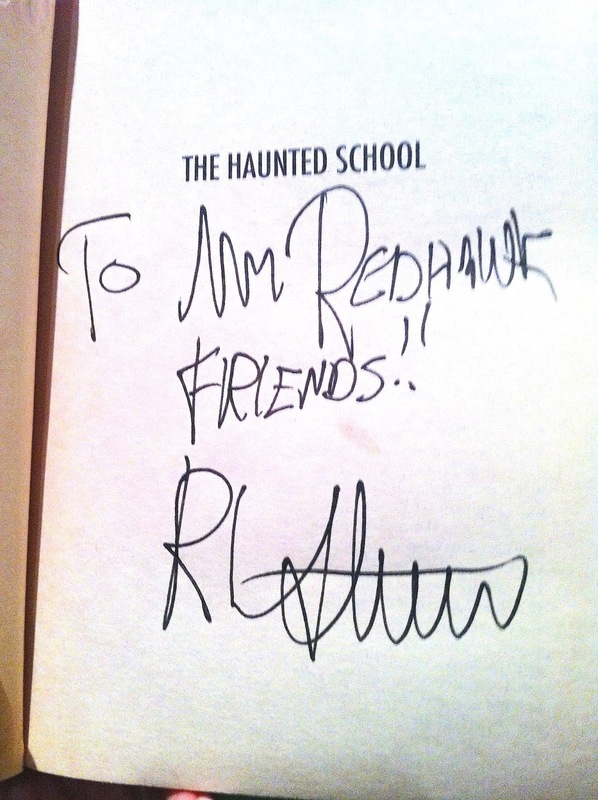 Since the new Goosebumps movie came out on October 3, I decided to revisit my night with R.L. Stine at the 2012 Tucson Festival of Books Author Dinner. Wondering if Stine’s parents had better luck raising a reader, I asked what types of literature he enjoyed as a boy. His response was, “Comics.” Specifically he read horror comics and Mad (before it was a magazine). Later he tells me his son’s major in college was English. The picture is complete. Stine’s son is every bit the reader Stine is. Stine later reveals that his son did finally pick up a Goosebumps as a college student. No doubt his son became a fan like so many others at that point. The moments I stole with my dinner partner were punctuated by people eager to share their love of all things Stine with Stine. I appreciated Stine’s patience with my questions about his writing process (lots of planning, editing, etc. each day and ten written pages on top of the other business). He also graciously signed a zillion books for my friends and a few to give away for work, though I forgot one for my children or myself. As I mentioned, people stopped by our table throughout dinner to express their gratitude for Stine’s work. Eventually a small mob developed and Stine generously answered questions gave autographs and posed for pictures for all who asked. Dinner had ended and the festival crush was on. Stine loves book festivals. When he found out he was booked for just two sessions at the 2012 TFOB he requested two more. People formed long lines for his sessions and to nab his autograph. The Bookmans booth has sold out of Stine’s books that year and every TFOB since. Surprising fact: @R.L._Stine loves Twitter. He likes catching up with readers so take a moment to follow him. He’s clever quick and gives me goosebumps.